This edition of a popular Greek text is designed for intermediate college classroom use. 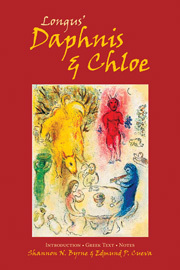 Students enjoy Longus' Daphnis and Chloe, a tale about young love and country life, without needing much background knowledge. Longus' Greek is straightforward and provides opportunity for a thorough review of Attic Greek. The running glossary and explanations of the grammar and syntax serve to move the reading along, allowing the instructor to decide when review is necessary. I love this text- so fun to use!